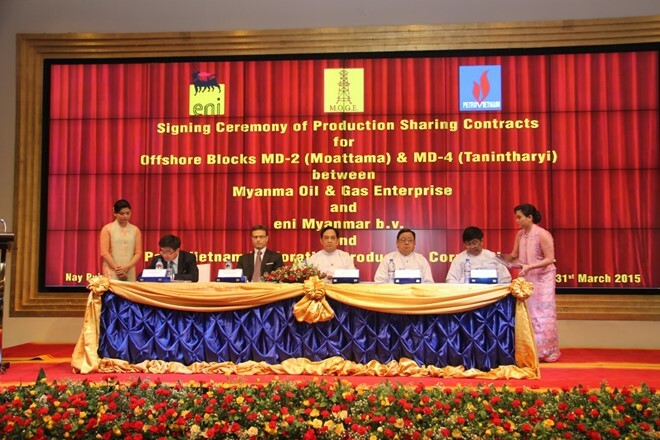 HA NOI (VNS) — The PetroVietnam Exploration and Production Corporation (PVEP) has signed a production-sharing contract (PSC) for blocks MD2 and MD4, off the coast of Myanmar, with its Myanmar partner. Under the agreement, the PVEP will have a 20 per cent share, while the Italian Eni Group will manage the project through the company Eni Myanmar B.V. Covering 10,330sq. km, Block MD2 in southern Bengal Bay is the largest oil and gas field in Myanmar. Block MD4, located in the Moattama basin, southern Andaman, covers 5,900sq. km. The PVEP has conducted oil and gas activities in Myanmar since 2008. The newly signed PSC is an important move in the PVEP's strategy to boost its oil and gas exploration and exploitation abroad and serves to further consolidate the cooperative relations between the two nations. The PVEP has taken part in the management of 20 oil and gas projects in 15 countries. It has conducted exploration and exploitation activities at oilfields in Malaysia, Peru and Venezuela.